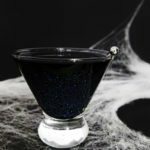 A black shimmering Halloween or Galaxy cocktail made with black vodka, lime juice, and simple syrup, Black Magic cocktail. Recipe for ages of 21+, please drink responsibly. This post contains affiliate links, please see our Site Policies for further information. Updated OCT 22, 2017* Please see note. For me, Halloween wasn’t about the scary things, it was about all the fun that came with the holiday. I loved making caramel apples, sherbet punches, and there were always crafts galore! Of course, as I’ve grown up, I’ve carried that same love of Halloween into adulthood. Except I get to have way more fun with it now. Maybe it’s from growing up with movies like Hocus Pocus, Harry Potter, and Practical Magic, but I am fascinated by witches. Not that I necessarily believe in them but the concept just entertains me. Since we learned that in the Harry Potter world, I’m a grade A potions master. It was time to take a stir into a little darker witch magic and trust me, you can’t get much darker than this. This recipe has been changed from the original posting. You can find the original recipe at the bottom of this post, as I know some users did not have issues with it. There became many inconsistencies with how this cocktail turned out color wise. Sometime black, sometimes red. So I apologize if you’re coming from Pinterest and the ingredients are now different from the original posting we wanted to change the cocktail to ensure a black cocktail every time. This new vodka lime daiquiri cocktail fixes the original issues. To keep this cocktail black it needs to be a higher ABV cocktail, as it previously was, so please drink responsibly. 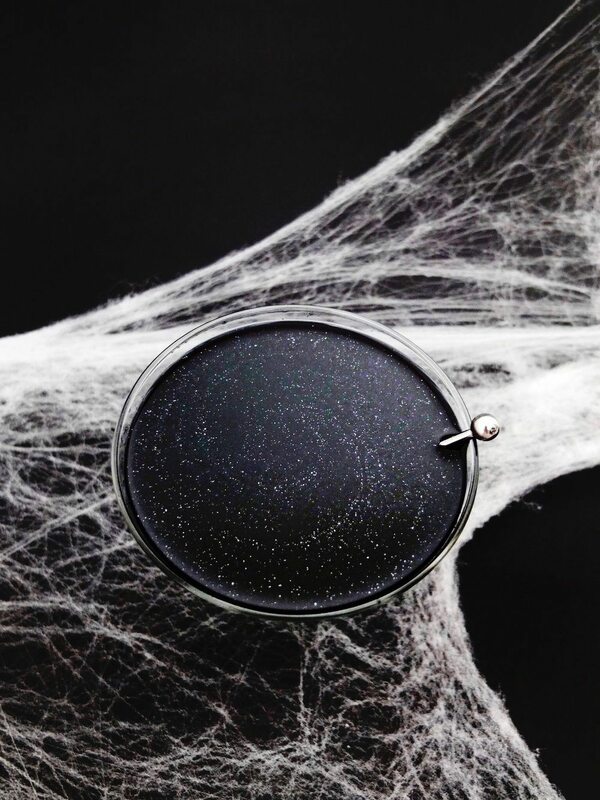 A Black Magic/Galaxy Cocktail that is shimmering and black. A mix between a lime daiquiri and lime martini. Into a cocktail shaker add in your simple syrup, lime juice, and black vodka. Fill with ice until the liquid line. Give it a hard shake for 30 seconds. Add a dash of pearl dust to the bottom of a martini or coupe glass. Pour cocktail into your glass and serve. Add more pearl dust if it's not shimmery enough and stir it with a bar spoon to combine it. Grab the Wilton Pearl Dust in White here. You can also use the colors in Silver & Gold for different effects. These photos are using the white color. In this recipe, I use Blavod Black Vodka. This vodka can be hard to come by in certain areas. Though always easier around Halloween time. There are other companies who have come out with black vodkas, so use whatever you can find. If you have trouble finding it you can make your own. I will warn this is messy and like using most food dye it will stain your mouth. Into a separate jar add 1 cup of vodka (plain or flavored) and 4 drops of Wilton Black Icing Color. Stir or shake until fully combined. Keep in an airtight jar in the fridge until use. Use the same portions as the recipe. Tell me one of your favorite things about Halloween, if you celebrate the holiday. I’d love to hear all your stories filled with tricks and treats! In the bottom of a shaker add your black vodka, cherry juice, orange juice, maraschino cherry syrup (liquid in the maraschino cherry jar), and pinch of pearl dust. Add in your bar spoon, the ice to the liquid line, stir your cocktail until chilled, about 10 seconds. Strain into a chilled martini glass and serve. Garnish with orange peel or maraschino cherries. I recommend making this ahead of time and test out how to set up lighting on your drink table to get the most glitter effect. In a dark room the glitter is harder to see. If you find the cocktail pulls brown on you, remove out the orange juice and up the cherry juice to 2.5 ounces. It should help keep the dark color. Hi! Could I make this in a batch? I wouldn’t recommend it, as martini style cocktails typically don’t do well in a batch form.